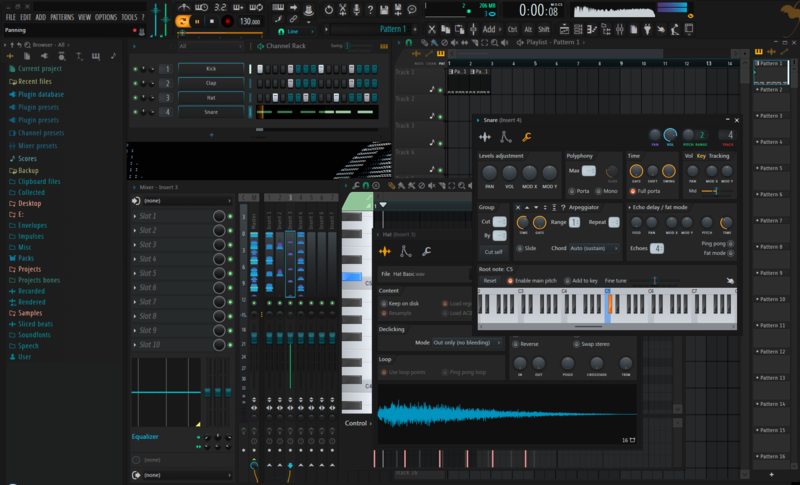 Discussion in 'FL Studio' started by mono, Feb 10, 2018.
and also update this page with any new info that we come across to help user make there own skins. one for the icons and fonts, one for the patches and one for the skins them selfs. Because most users will just want the skin ,ill start with them first and work down from there. 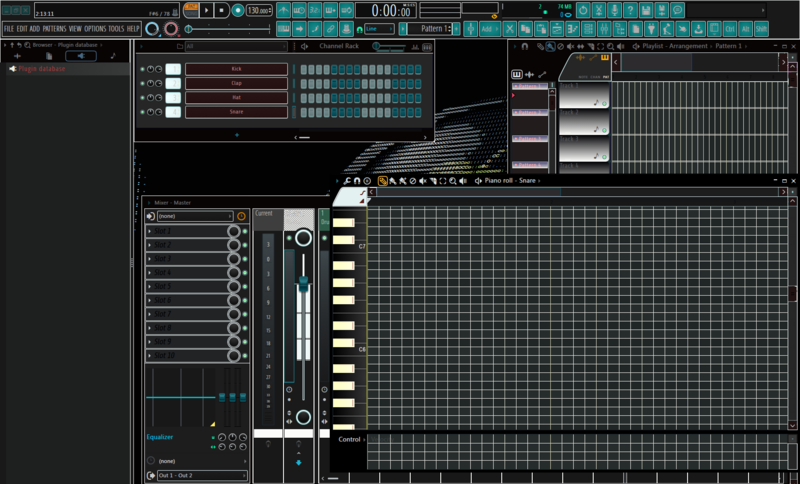 from Image-Line to install Fl Studio. you can eader post them here on this page or send me a PM so this frist post will be updated with them.This will save users having to search for them as well as the info on how to reskin Fl. some skins are still missing so will update this page again over the next few days. over the last few mts so hope it comes in handy. and what made us keep going. and change the color in the RCdata it can be updated again if needed. but with r4e's vid use should under-stand what to do. you will see folders and the color settings are to be found in the RCdata folders sub-folders. and can save you lots of time doing it this way.Restorator is very fast at this. 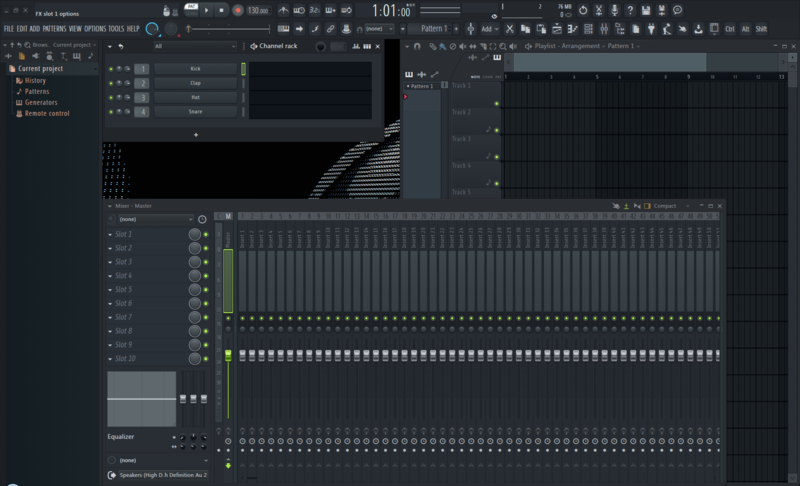 then hit enter to save it and then resave and open fl studio to see the changes made. but did not save the FLEngine inbetween the changes you can sometimes get a error like the color is still the same. 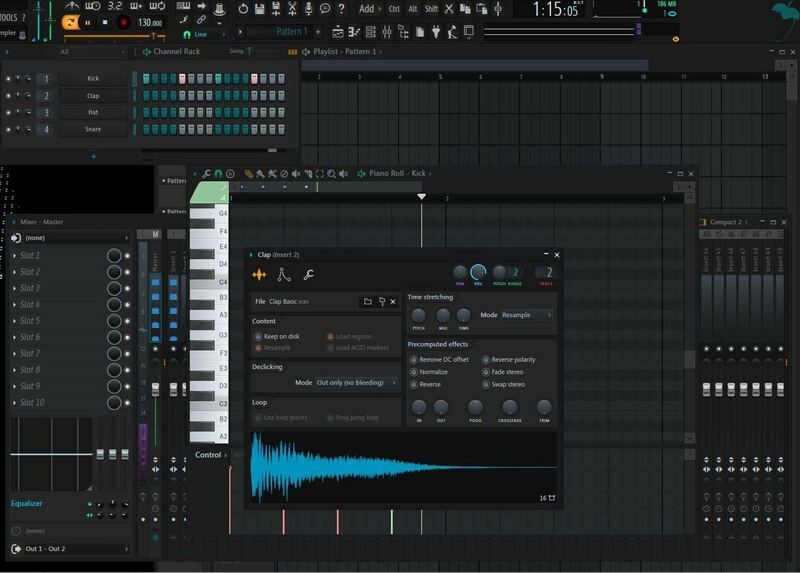 FLEngine_x64.dll or FLEngine.dll inside your fl studio folder and will save you time. The other ClBlack or ClBlue CLRed color codes that are not used that much can be found here. and there are lots more that you will see but this will get you started. Changes the color on the playlist snap to grid tab + piano roll tools tab + piano roll stamp tab. There are more settings in the fruty wrapper's for the plugins page. 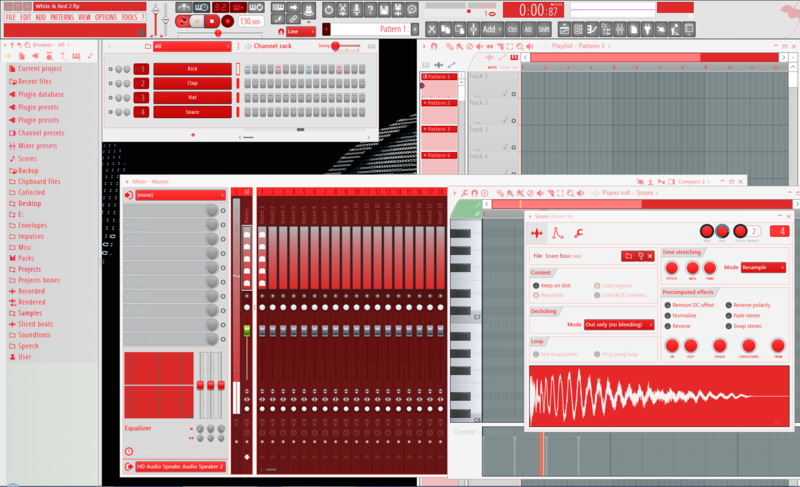 TFRUITYLOOPSMAINFORM = Top toolbar / Right bar on browser window / vol / pitch / play / stop / song position. TWAVRENDERFORM = Save export wav ,mp3 ,ogg pages. with some been in the wrapper for the plugins page. These need a debugger to change and find the color code. 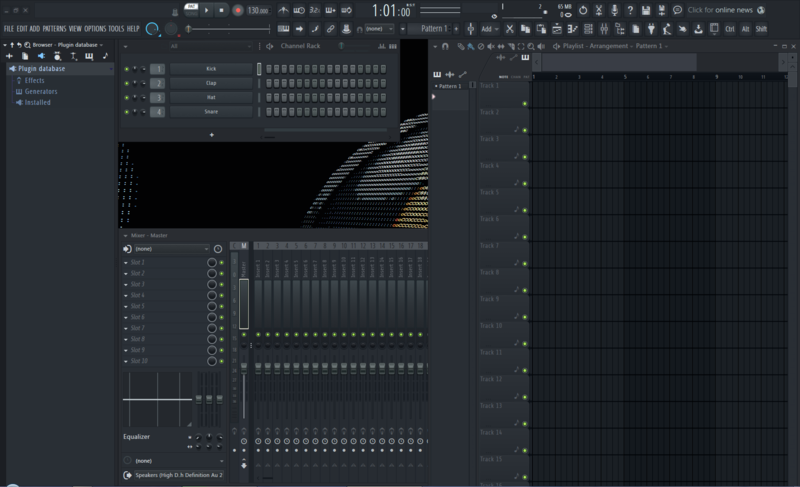 In fl studio 20 the full toolbar can now be found and changed in the RCDATA folder. The patches provided will help you color in the parts of FL Studio that are missing in the RCData folder this is the hardest part of sking fl and there are times you will go WFT. so used have it easy trust me. Best thing to do with these patches is just get stuck into it , put on a few nice tunes and see how it goes, while some parts are easy to change other parts have no way of under-standing them or at least for me, the channle rack blocks ,mixer faders, and inside browser are the worce parts to recolor so with these few bits, luck is needed and lots of time. with these you can remove the 0xff and most times they will come on a list or block with other 0xff. or you can try your luck at changing just the shr eax, 0x10 numbers ie 1 to 99 or a to g.
removing the ff if needed so 0xff000000 will look like this or r8d, 0x1234568. these color codes can all be found in ColorManias drop down list. so if one color code don't work for you try an other till the color changes how you would like. The patch are not 100% sorted so you could get two patches that change the same part. I've also made a quick vid on how to load the patches and how to save your work as you go. Program used to load in the color code patches. This one is for use with R2Rs Keygen/no keygen added. only the RCdata can now be changed. Make sure FL isn't running when installing the theme. Otherwise the Theme selector will restart your PC to replace the theme at the next start. In the archive of my latest ABitDarker skin, you find a folder called fl.logos that contains the example logos 1-8 + some more + all the info. 2. Best to save your old ILGlyphsEx.ilfont file (if you accidentally forgot, there's a backup included) and simply replace it. 3. Make your own logos,use APPs like Fontlab Studio 5. Eader U use existing vector images or make your very own. There is a free APP called Inkscape which helps you with that job. Use it's tracing algorithm for transforming bitmaps into vector graphics. A screenshot is included that shows which settings you should use when tracing a bitmap. 5. After converting, you won't see anything happened, because inkscape places the vector graphic on top of your picture. Drag that away (and voila..magic..and it even looks better because there are no pixels anymore). Copy that into a new file which you save as .eps (postcript). That .eps you can now import to Studio5 to finally bring your own vectors into the .ilfont. Can someone remove the logo from the ILGlyphsEx. Btw. Found an even better tool to edit fonts cause Fontlab Studio sometimes alters some glyphs when exporting edited fonts. It's called "High-Logic FontCreator". If someone needs it, just write me. Ps: Even this font file got deleted by Image-Line. If anyone needs it, write me a pm. 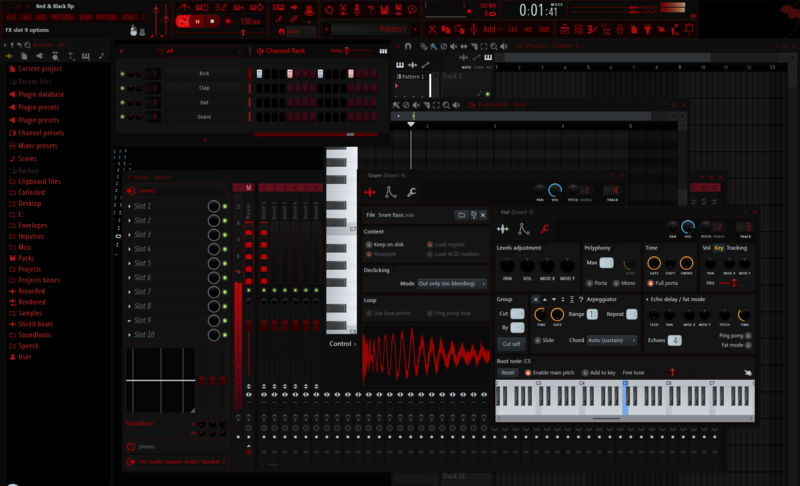 can anyone re upload black skin for fl 20.0.0.477 please!!?? Haha looks interesting. I'm all for some abstract skins. and also update this page with any new info that we come across too help user make there own skins. Because most users will just want the skin ,ill start with them frist and work down from there. File not found... Really like that Snow white. VERY ATTRACTIVE. I already made one but some paremetre missing like the sliders color on mix track.. And the Step sequencer Color.. That dark aqua color.. If i am correct.. Still fond folder for it. Does anyone how to make these work in FL20? Cheers. and an other new one share here by robertdgray.